Zionist Union head Avi Gabbay agrees to put Tzipi Livni as opposition head in exchange for agreeing to support Gabbay as candidate for PM. 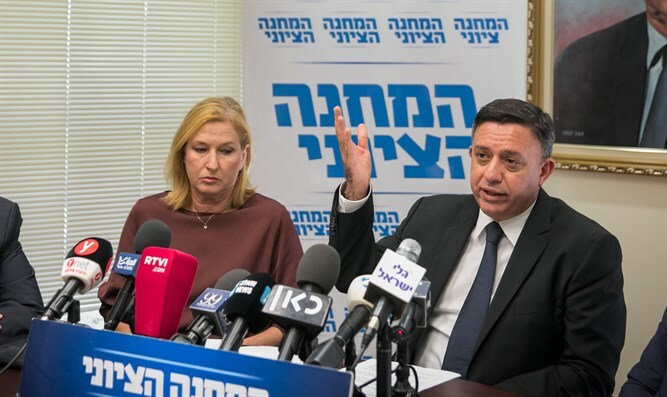 Zionist Union head Avi Gabbay agreed to install MK Tzipi Livni as the opposition leader in exchange for her agreement to support Gabbay as the faction's candidate for Prime Minister in the next elections. "Today we are taking a significant step in building the alternative to the current government," said Gabbay. "The camp that will be a new hope for the citizens of Israel and will allow us to invest all the energies outside, by convincing new sectors." "MK Livni brings a lot of experience to the position, especially on political and security issues, and I have no doubt that she will create new energies in the opposition," added Gabbay. The announcement follows weeks of marathon negotiations between Livni and Gabbay ever since former Opposition leader Isaac Herzog was elected to replace refusenik and former minister Natan Sharansky as the head of the Jewish Agency. Once the chief of the Zionist Union – a joint list comprising the Labor and Hatnuah parties – Herzog was ousted as chairman in 2017 by former Environmental Protection Minister Avi Gabbay. Despite the loss, Herzog continued to serve as Leader of the Opposition – a position reserved for members of the Knesset – since Gabbay is not currently an MK. Once the chair of the Kadima party, Livni served as Leader of the Opposition following Binyamin Netanyahu’s return to power in 2009. Ahead of the 2013 election, Livni formed the new Hatnuah faction, winning six seats. Livni and Herzog merged their two respective parties ahead of the 2015 election, forming the Zionist Union list. As part of the merger, the two leaders agreed to a rotational power-sharing agreement if the Zionist Union won the 2015 election, with Herzog serving as premier for two years, before handing off power to Livni. Livni had lobbied hard for the role of opposition leader and had even threatened to leave the Zionist Union if she was not selected. However, Gabbay was loath to gift Livni the prominent post only to see her leave before the next elections and be an electoral rival to the Zionist Union. In a show of support, Zionist Union heavyweight MK Shelly Yachimovich praised the newfound arrangement between the two leaders of Israel's biggest opposition faction. "I welcome the agreement and see it as important for the strengthening of the Zionist Union, and I am sure Livni will be an excellent opposition chairman and wish her success," she said.